It was the first game of the season for the York Wildcats and it was a great game!! Portsmouth came to town and it was a close battle throughout. After struggling to put the ball in the net to start the game, York was able to stay in the game with their defense and hustle. By moving on offense, hustling back on defense and finally hitting some shots, York was able to make the game go back and forth and bring it down to the wire. With the offense spread out the Wildcats were able to take advantage of opportunities created by the guards and big men with a few easy baskets. Portsmouth was able to keep their composure and not turn the ball over in the final minute to take the game by 5. Coach Mackey is very impressed with the performance of his squad and he can't wait to coach this team the rest of the season. Next up is an away game tomorrow at Massabesic. It was the second game in a row for the Wildcats and again it came down to the wire. In fact it came down to the very last shot of the game. With the Wildcats up the entire game, Massabesic took advantage of the home court advantage, which ummm included some home court calls down the stretch, plus the fact that the Wildcats were not able to put the game away a couple of times earlier in the game, and they were able to hit a last second buzzer beater to come out on top with the one point win. York came out on fire in the first quarter but throughout the game Massabesic was able to chip away at the lead little by little, until finally at the end of the fourth quarter, they were able to take advantage of the home court and get the last second win. Massabesic was able to do execute when it mattered most and that was the difference. York will use this as motivation as the season continues and they will grow because of the two close games to start the season. Next up for the Wildcats is an away game at Sanford on Monday the 4th. It was the first of three games this week for the Wildcats as they visited the Sanford Spartans. Sanford came out hot and hit a bunch of shots to open the first quarter. York tried to answer and did a great job against Sanford's press but the ball would not go through the hoop for York. Sanford won the first quarter and carried the momentum throughout the whole game. York took quality shots and even though the shots were not falling they still had each other's backs and played hard throughout. Coach Mackey is very proud with how the team responded when they were faced with adversity and that will bode well in the future. Next up for York is a home game verse their rival Marshwood. 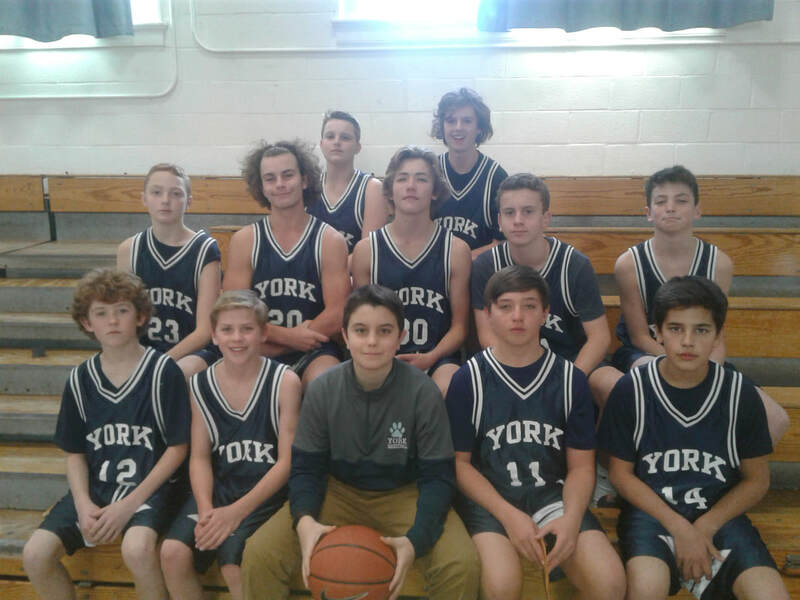 It was the second of three games for York this week and they were back at home to play against a skilled Marshwood Hawks team. The whole game was close, as the score was tied after the first three quarters. In the fourth quarter Marshwood was able to make key plays and keep their composure as the game was heading down the stretch. York fought hard the entire game and never gave up as they went back and forth verse a quality opponent. This was the best that York has looked so far on offense, and especially on defense, and they look to carry their continued improved play verse Dover tomorrow and future opponents. Another away game for the Wildcats (their third in five games and also the first of three away games in a row this week) and another buzzer beating defeat. It was the fifth game of the season and four of those have gone down to the last few minutes with York coming up a play, bounce, or free throw short. Wells definitely deserves credit for sinking their free throws the entire game, which made it so York could never get the lead past ten. After a slow start for York, where they turned the ball over a handful of times, they were able to settle down and play quality basketball in the second quarter which made them have the lead at half. After a well played third quarter which saw the York lead grow to ten, Wells was able to come back and hit a shot at the end of the game to win it by one. Just like in the Massabesic game York held the lead for much of the game, except for when it mattered most. York will look to learn from their mistakes and get ready for the next of two more away games this week. Next up for the Wildcats is supposed to be a game at Dover tomorrow but the weather may have something to say about that though. If the game is postponed or cancelled then the next game will be at Kittery on Wednesday. Surprise Surprise the York 8th Grade Boys game went down to wire. But this time it was York who was able to keep their composure, hit key free throws and make key plays when it mattered the most. Both teams shot extremely well from the floor for the entire game as the game came down to the last seconds....once again. Like in previous games, York had a slim lead in the final minute but important free throws were made and Trevor Parker (gutsy shot) hit a three to extend the York lead from two to five points in the final 10 seconds. Kittery last couple of shots did not go down, which made the final score 59-54. The close games up to this point helped out in a big way and that will be key as the season moves forward. Next up for the Wildcats are two home games next week, as they take on Noble on Monday the 18th and Wells Thursday the 21st. The York Wildcats were back on their home court as they hosted Noble. The game was back and forth throughout, with Noble on a couple of occasions getting ahead by 9 points. York was able to keep their composure and battle back in the fourth quarter. Although it was another close game, it was York who had the ball and the last second shot, instead of the other way around. York was not able to capitalize though as a last second three rimmed out. ​This was an amazing effort because last night they found out that one of their best players was lost for the season. That fact that they battled and played extremely hard shows that no matter what they have each other's backs and will not give up. Next up is a home game verse Wells Thursday. This was a back and forth contest as York took on Wells for the second time in two weeks. Shorthanded, York was able to fight through some injuries to come back from a double digit deficit to take the lead in the fourth quarter. At half time Wells was able to erase a four point disadvantage and make it a double digit lead at the beginning/middle of the third quarter. Just like in the first game Wells once again executed down the stretch, while the Wildcats, without some ball handlers because of the injuries, were not able to overcome the frenetic pace of the last minute and a half. Wells made plays at the end to take the three point win. Next up for the Wildcats is one practice during break to go along with the Scarborough tournament. After a lengthy break the York Wildcats were back at home to take on the Biddeford Tigers. Usually it is the offense that needs to shake of the rust but in this case it was the little things, like boxing out, that York had trouble doing in the start which hurt them as #32 for Biddeford was able to get rebound after rebound and get second chance points in the first half. The Wildcats were able to adjust and keep the score close the entire game, until the final minute when Biddeford hit three 3 pointers in a row to move a 3 point lead to an 12 point lead. York never gave up though, as they found themselves down the entire game and just like every game this year fought back to make the game in doubt. A successful first game back and York looks to build on the momentum as they face the very talented Marshwood Hawks. The Wildcats fought hard as they hit the road to play against the Marshwood Hawks. Marshwood has an excellent team which has many dangerous players who do many things well. In the last game, verse Biddeford, York struggled with rebounding to start the game, but in this contest the Wildcats did a great job of limiting Marshwoods second chance opportunities with how they boxed out. However telegraphing passes was the main culprit for why York struggled, especially at the beginning of the game. Knowing York though, they will work hard on passing in the upcoming practices and will be ready to go verse Saco next Thursday. After a week off the Wildcats were back on the road to visit undefeated Saco. Saco had many excellent individual players, in which York had a hard time keeping up with. The Wildcats had an excellent first quarter and showed no signs of rust after more then a week off from games and whenever Saco tried to do the man to man press, York was able to beat it time and time again easily to keep the score close after the first. What hurt York the most was Saco's depth and whenever York missed shots Saco was looking to run and had many transition baskets. One thing that improved for the Wildcats was they had far less turnovers in this game compared to games in the past and they did an excellent job boxing out Saco's bigger team. One more thing that Coach Mackey was impressed about was how York kept their composure the entire game, especially when Saco, up by 30 in the fourth, and their fans started to taunt the York players. York showed that they were the classier team by still working hard and by playing team ball no matter the score or what was happening on and around the court. Next up for York is three games next week which is the last week of the season. The first game is the last home game of the season verse Sanford at 4:30. The last home game for the Wildcats looked and played out a lot like the first half of the season, when the game came down to the last minute, although this time around York was able to make plays down the stretch....just not enough. Despite Sanford and York being down a few men, both teams played extremely hard and this was a fun game to be a part of. The game went back and forth and neither team was able to push the lead past 6 points the entire game. Down the stretch Sanford was able to get the ball into their playmakers hands while York fought and also made some key plays and got the lead down to 1 point with 4 seconds left. Sanford made one of two from the line and York had to set up to take the ball down the length of the court and they got a decent look. For York, out of all of the close games this season (which there have been many), this game showed how much they have improved this whole season. Sanford beat them handily the first time around and this time York kept it close and had the lead, also they made plays down the stretch (Sanford just made one or two more plays at the end), which again was their achilles heel in the past. York plays Biddeford Wednesday and then finishes up the season at Dover on Thursday. This was the best game of the season for York! York was able to put everything together, during the whole game they were active on both ends of the floor and took quality shots. They took advantage down low time and time again and that opened up things for the guards. Everyday this season York has worked hard, and had each other's backs and it paid off tonight. From the beginning everyone boxed out, which was the difference between the first and second times these two teams played.